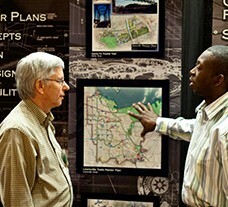 Through a smart, agile management strategy, Halff has become an integrated provider of full-service engineering, architecture, environmental, planning, landscape architecture, right of way, surveying and information technology services for public and private sector clients in the government, corporate, development, education, oil and gas, and transportation markets. Founded in 1987 and headquartered in Tampa, Genesis Halff has served thousands of public- and private-sector clients throughout Florida and the Southeastern U.S. Genesis Halff has a highly experienced team of planning and design professionals that excels in transportation, land and site development, public works, planning and landscape architecture and intelligent transportation systems (ITS). Click here to learn more. Genesis Halff CEI has been improving communities through quality construction engineering and inspection services for the last 20 years throughout Florida and the Southeastern U.S. Our dedicated, professional team offers extensive knowledge in construction, engineering, inspection and many other aspects of project administration, including utility coordination, Contractor Quality Control (CQC), scheduling, claims analysis and dispute resolution. Click here to learn more. Halff TriTex specializes in natural gas processing, safety and hazard analysis, pipeline services and oil field production services. We have senior design engineers with in-plant operations experience who can troubleshoot issues and evaluate designs. Halff TriTex provides innovative design, program management and staff augmentation services. Click here to learn more. With roots that go back more than 50 years, Halff+Marlar has unique, in-depth knowledge of Arkansas’ landscape. 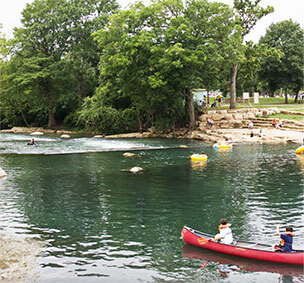 Halff+Marlar staff has helped public and private clients transform and rehabilitate Arkansas’ infrastructure and environment while preserving its natural resources. We offer a full range of planning and design services. Click here to learn more. There is no cutting corners here. Our clients deserve honesty and transparency, and we believe success only matters when it is achieved by always doing the right thing. 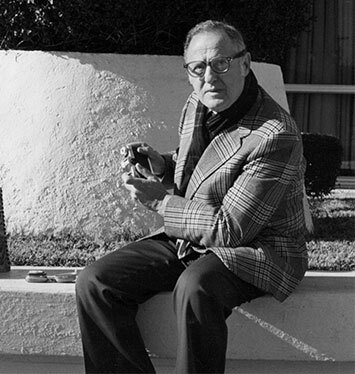 Dr. Albert H. Halff, P.E., Ph.D.
Albert Henry Halff was born in Midland, Texas, on Aug. 20, 1915. 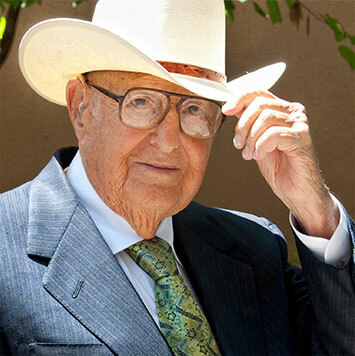 He earned his Bachelor of Science in Civil Engineering in 1937 from Southern Methodist University (SMU), and his Master of Science in Civil Engineering in 1942 from Illinois Institute of Technology. He married Lee Benson in Chicago on Aug. 24, 1940. In World War II, he served as an officer in the U.S. Army Medical Corps. After the war, he became an associate professor of civil engineering at SMU. He earned his Doctorate of Engineering degree from Johns Hopkins University in 1950. On Dec. 4, 1950, Dr. Halff founded “Albert H. Halff Consulting, Sanitary Engineers” in a one-room office in Snider Plaza, near SMU in Dallas. In 1953, Dr. Halff and his partner Allen Hundley each contributed $1,000 to form “Hundley and Halff.” In 1960, Dr. Halff amicably split with Hundley, and formed “Albert H. Halff Associates” in Dallas. 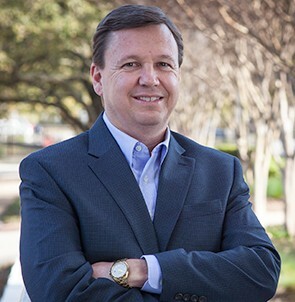 Under Dr. Halff’s leadership, the firm became a pioneer in hydraulics, hydrology and floodplain management, and grew to be one of the largest independently-owned consulting engineering firms in Texas. Dr. Halff has a legacy of distinguished service to his profession. In 1981, he was named by the Texas Society of Professional Engineers as “Texas Engineer of the Year.” He is a Fellow and Honorary Member of the Texas Section of the American Society of Civil Engineers (ASCE), and, in 1984, was awarded the “Award of Honor,” the highest award of the ASCE Texas Section. On Feb. 27, 2004, Dr. Halff was awarded the School of Engineering “Hall of Leaders” award from his beloved SMU. 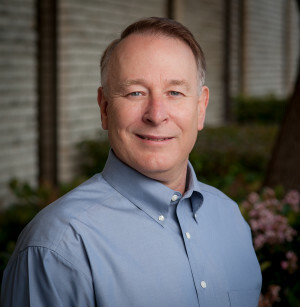 Dr. Halff holds 13 patents on engineering advances, including innovations in desalinization, water treatment, industrial-waste treatment and ion exchange. We improve lives and communities by turning ideas into reality. Our founder, Dr. Halff, had a deep commitment to innovation in engineering—not to gain any fame or monetary reward, but to better serve the public. He had an abiding faith in, and love of, people. He expressed that love in his work, his friendships and his boundless commitment to help others in any way he could. He started it all, and now we carry it on. 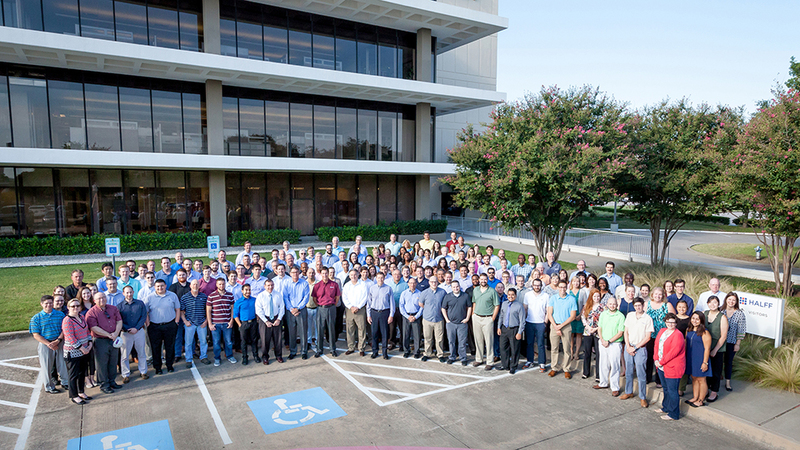 This means everyone at Halff—employees who have been here for more than 40 years and people who started a week ago. We have a shared vision and a shared purpose. 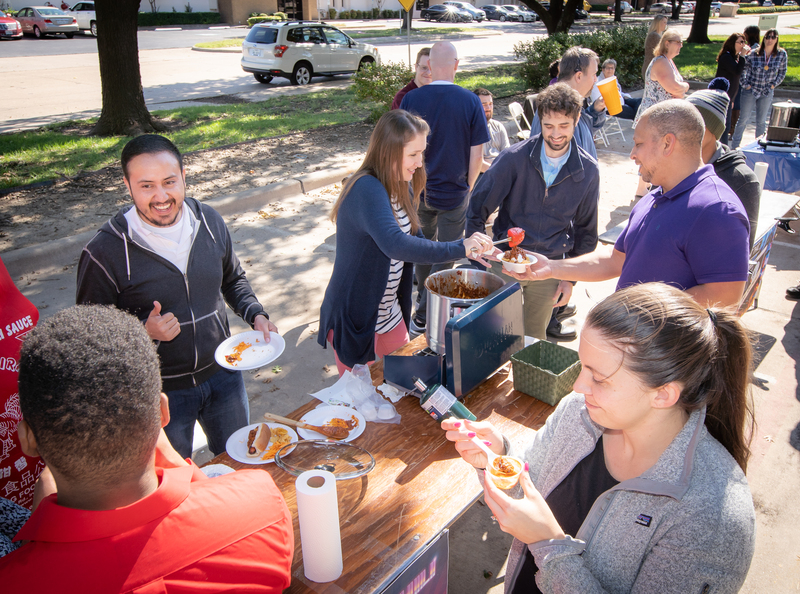 We improve the lives of the people of Halff by providing challenging and rewarding career opportunities, as well as people in our local communities through Halff Community Initiative and the work that we do. 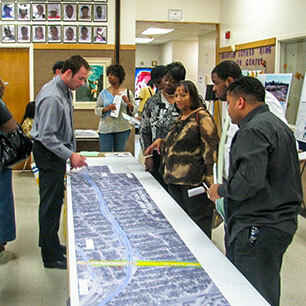 We improve communities through every service we offer. 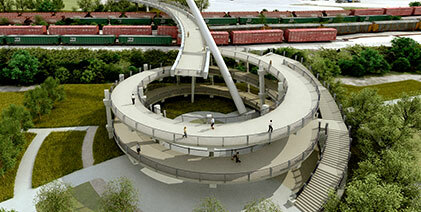 We design safe roads, highways and bridges. We develop better water, sanitary sewer and storm drain systems. We help prevent flooding. We create beautiful cities and parks. We improve our environment. We facilitate the flow of energy. And so much more. 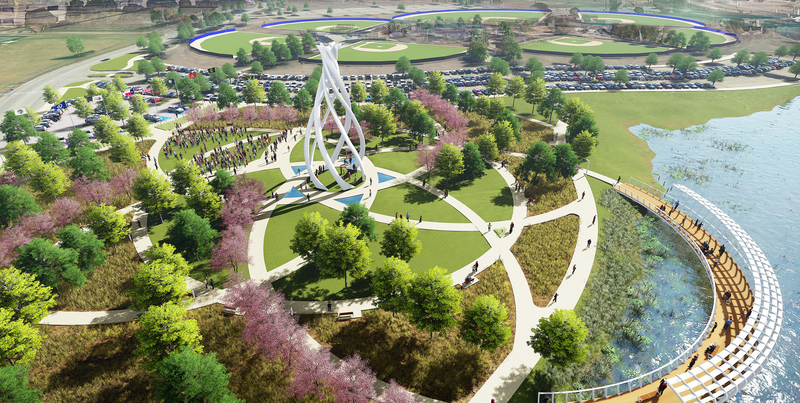 We visualize the future. … BY TURNING IDEAS INTO REALITY. Dr. Halff’s legacy. We do create smarter solutions! Halff’s results-oriented Management Team has long been committed to providing smarter solutions that result from collaboration and a distinctly personal touch. This passion for personalized service flows directly from Albert Halff’s belief that a company is nothing more than the sum total of its people. By nurturing individuals and providing trust and autonomy, all the teams of the organization are unleashed to pursue the best possible solution, the best possible way. Our clients deserve no less. 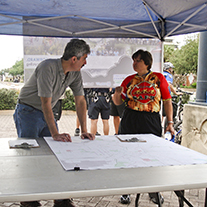 Dedicated to promoting the engineering industry, Pat serves on the Texas A&M Civil Engineering Advisory Council. For years, he has volunteered his time to the YMCA, including serving on the YMCA of Metropolitan Dallas Properties Committee and the Lake Highlands Family YMCA Board of Managers, helping to oversee the building of the Lake Highlands YMCA. When he is not fishing or golfing, his “one big family of Aggies”—wife Kathy and their three children—are cheering on their alma mater. Roman kicked off his Halff career in 1978 as a co-op student earning $3.75 per hour and received a handsome 50-cent raise only six months later. 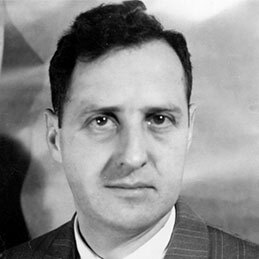 Dr. Halff later sent him to London for a year as an exchange engineer at Mott, Hay and Anderson, where he worked on the approach roads to the Channel Tunnel. Since then, he has worked on hundreds of land development projects, including more than 100 in Mexico. “One of the things that causes people to stay at Halff is the ability to chase your dreams and work on interesting projects.” Roman became Executive Vice President in 1997 and then COO in 2013. He oversees and shepherds the production teams. 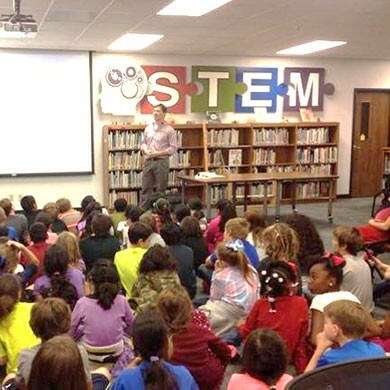 Roman was a TSPE Math Counts teacher for eight years and currently serves on the boards of the McKinney Avenue Transit Authority and Bishop Lynch High School. He is an avid traveler, a classical pianist and a connoisseur of single malt scotch. Roman’s Aggie family of six includes his wife, Sharon, and four grown children. 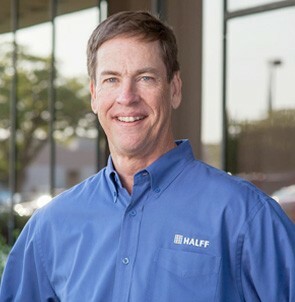 Joining Halff in 1983, Greg began his career as a civil engineer with a focus on land development and infrastructure improvements, but he soon became interested in how clients selected engineers. “I was curious about discovering what clients want and how best to meet those needs. 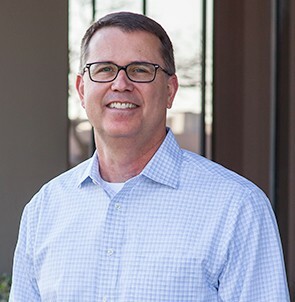 This interest led me to expand my career to the marketing and business side while still maintaining ties to the technical side.” Since 1998, he has directed Halff’s business development and strategic teaming efforts. Greg gives back to the industry through board and committee service, including the Society of American Military Engineers (SAME), where he has served in elected positions both locally and nationally. He takes pride every year in being part of the SAME committee that awards scholarships to graduating high school seniors who will study engineering as well as the Society’s efforts to support Operation Once in a Lifetime. 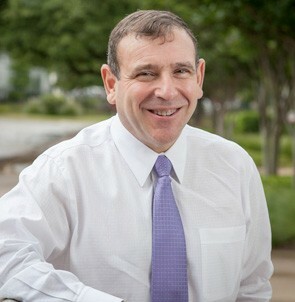 Greg resides in Dallas and has been married to his wife, Wendy, since 1992. 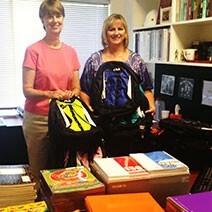 Their daughter followed in Greg’s footsteps and majored in civil engineering at Rice University. Russell is the most recent addition to our management team, joining us as chief strategy officer and executive vice president. Prior to coming to Halff you could say, in the famous words of Johnny Cash, “He’s been everywhere, man.” Not only did he move around Texas as a young boy, but his career has taken him from Miami to Anchorage and almost everywhere in between to work on all sorts of civil engineering projects, primarily large transportation facilities. He’s worn many hats—contractor, consultant and owner—and he is known nationally as an expert in public-private partnership projects. Russell earned his Bachelor of Science in Civil Engineering from the University of Texas at Austin. He sits on the Board of Directors for the American Road and Transportation Builders Association and was the organization’s 2014 Public Sector Entrepreneur of the Year. Russell “grew up on the water” and is an avid outdoorsman. When he’s not working, you will likely find him spending time on Lake Travis in Austin or in Colorado with his wife, Kim, and his son’s family. Russell earned his Bachelor of Science in Civil Engineering in 1983 and joined Halff that same year. Over the years, he has led a wide variety of engineering projects for the public and private sector, serving as project manager and principal-in-charge on numerous rewarding assignments in the fields of water resources, public infrastructure and land development. 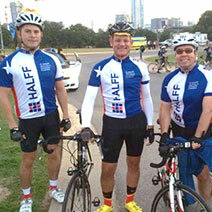 “I have loved the different challenges I’ve been able to take on at Halff. Working on a variety of projects keeps you on your toes, promotes learning and broadens your perspective.” Russell is a recognized national water resources expert and author of several technical papers and journal publications. He has served on Halff’s Board of Directors since 2006 and managed our Fort Worth branch office from 2010 to 2014, when he assumed the role of executive vice president overseeing companywide business operations. Russell actively supports the engineering industry and serves on the American Council of Engineering Companies (ACEC) Tarrant County Board of Directors. A civic-minded person, he is a Leadership Fort Worth graduate, and has served as an adult leader in his church youth group and with the Boy Scouts of America. 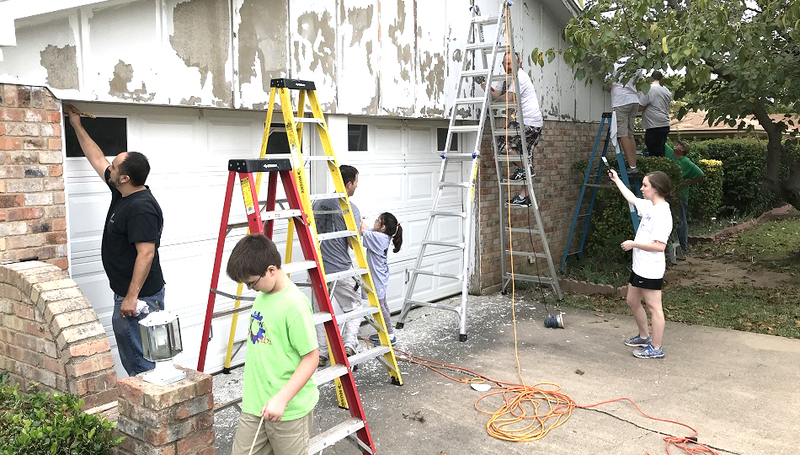 Russell is a lifelong resident of the Fort Worth area and now makes his home in North Richland Hills with his wife Teresa and their three children, who are all in the accounting field. Mark started his career as a petroleum geologist in 1984 and joined Halff in 1990. He started with the Environmental practice at Halff and initiated the Oil and Gas Services practice in 2006. “I’m truly inspired by the exceptional people of Halff and driven to expand our reach through growth, as growth creates opportunities for our people. 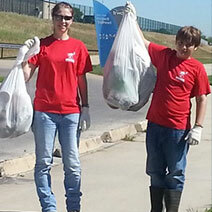 The environment at Halff is entrepreneurial. 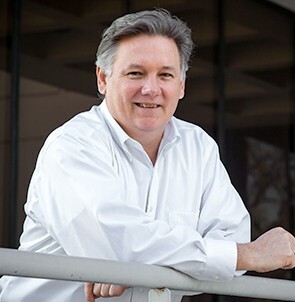 We provide our team leaders autonomy and flexibility to achieve their goals while working collaboratively to provide a responsive quality service to our clients.” Mark served on the Halff Board of Directors from 2013 to 2015 and also assumed his current role as executive vice president in 2015. Mark is on the Halff Community Initiative Board of Directors and is an active member of the steering committee. Mark lives in Plano where he was a youth basketball, football, soccer and baseball coach and president of the Plano Senior High School JROTC Booster Club Board. He is married to Desiree, and their favorite pastime is spending time with their three children who are “amazing people,” or at the lake. 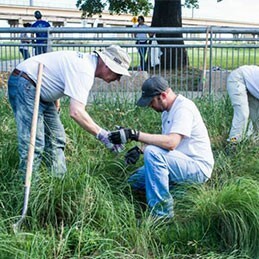 Halff is not just committed to our clients; we’re committed to our communities. That’s why we’ve established the Halff Community Initiative, a 501(c)(3) non-profit organization designed to give back our “time and treasures” to the communities in which we live and work. We’re busy giving back through initiatives such as Ronald McDonald House, Meals-on-Wheels, Salvation Army and many, many more. 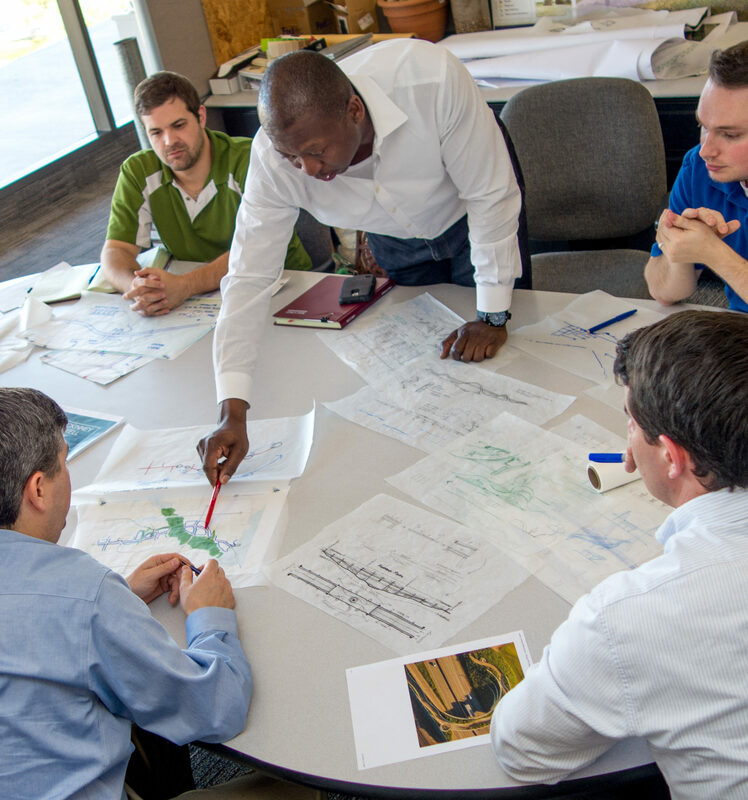 We are also committed to helping develop the next generation of engineers and architects. That’s why we help provide scholarships for gifted students at a variety of universities across the Southwest. It’s also why our leadership actively serves on university boards and remains active in a variety of professional organizations. Halff encourages and guides our clients to consider sustainability as an important factor in creating and developing projects that take into account the well being of people, economic stability and environmental integrity. Our goal is to design projects that use energy and resources sustainably, at a rate that does not compromise the natural environment or the ability of future generations to meet their own needs. Halff’s LEED Accredited Professionals and Envision Sustainability Professionals have the expertise to provide guidance and support in designing buildings that meet the U.S. Green Building Council’s criteria for sustainable design as defined by the LEED (Leadership in Energy and Environmental Design) program and civil projects that meet the Institute for Sustainable Infrastructure’s criteria for sustainable design as defined by the Envision program. We aim to design buildings, sites and infrastructure that use less energy, water and natural resources; generate less waste; and minimize the impact on land compared to conventional design, construction and maintenance techniques. 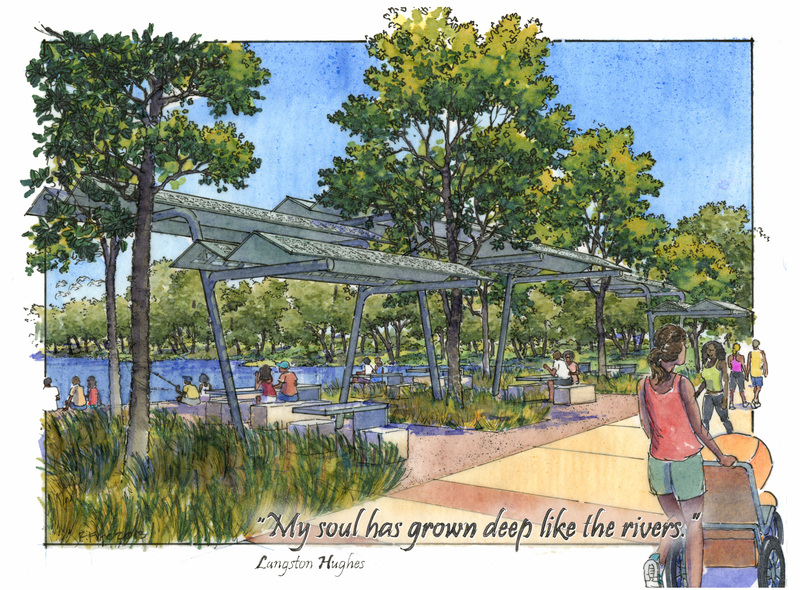 We regard site and landscape design as an opportunity to clean air and water, sequester carbon, reduce pollution, and restore habitat and biodiversity, while providing social and economic benefits to the immediate site and surrounding region. We utilize stormwater management techniques that include bio-retention, rain gardens and permeable pavement for green infrastructure/LID (low impact development). 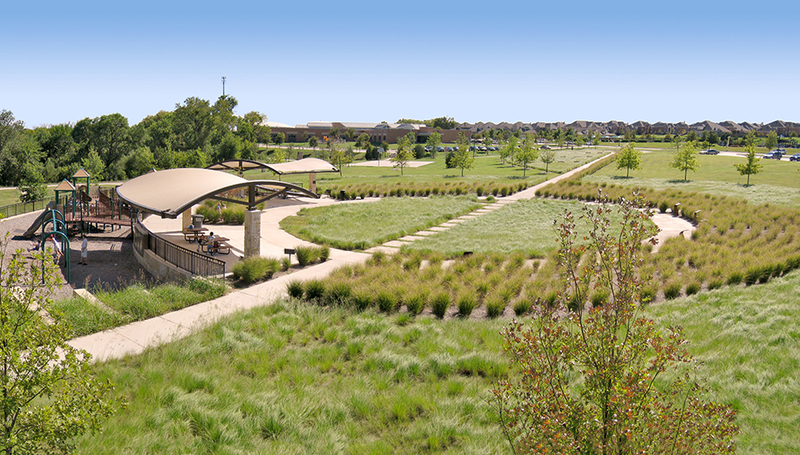 Our goal with green infrastructure is to promote infiltration, reduce stormwater pollution through bio-filtration, reduce impervious cover and reduce long-term maintenance costs. 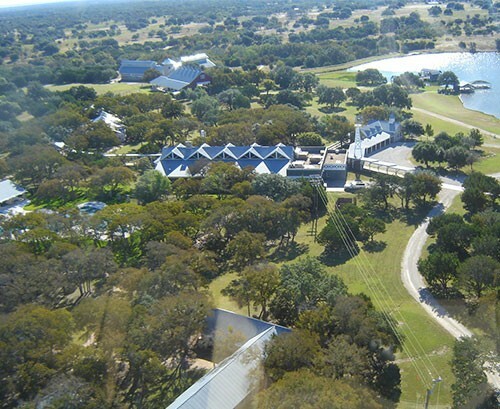 Camp John Marc is a therapeutic camp in Bosque County, Texas, serving children with chronic medical and physical challenges. The Camp asked Halff to conduct an Alternative Renewable Energy Analysis Study to evaluate alternative renewable energy generation and alternative energy sources to replace or supplement electricity. Achieve better control over energy costs and ensure long-term energy efficiency. Capitalize on the trend to energy independence and sustainability to secure capital funds. Share program concept and results with other camps. The study identified several potential energy and cost saving alternatives, including implementation of geothermal energy systems and replacement of electrical heating and cooking facilities with propane. A Phased Energy Source Conversion plan was developed to implement the program in a cost-effective manner that would result in meaningful energy use reduction for the camp. The program results in a 35 percent reduction in total energy usage for the camp, a reduction of 80 percent of the demand cost and a 46 percent reduction in the total energy cost for the camp. With a Capital Improvement Cost of $805,000, and an energy savings of $42,000 per year, the program results in a payback time of 19.2 years. 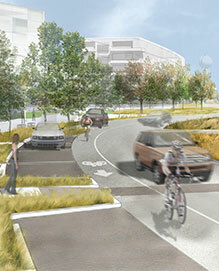 The challenge was to design a new “green” 60-acre mixed-use development and interior roadway system that incorporates Low Impact Development (LID) techniques with the goal to reduce impervious cover, promote infiltration, reduce stormwater pollution through bio-filtration and reduce long-term maintenance costs. 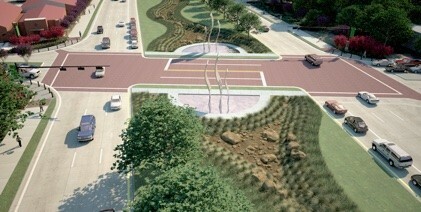 Halff’s multi-disciplinary project team, consisting of urban planners, architects, landscape architects, engineers, ecologists and scientists, pushed the practice of LID by optimally designing stormwater control measures to not only convey and treat stormwater on site, but to also provide ecosystem services and other amenities meaningful to users. The premise is that the cultural and programmatic needs of the site need not be mutually exclusive from the hydrological and ecological needs of the greater landscape. 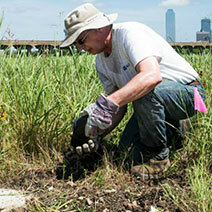 Consequently, stormwater is transformed from a waste product into a resource. 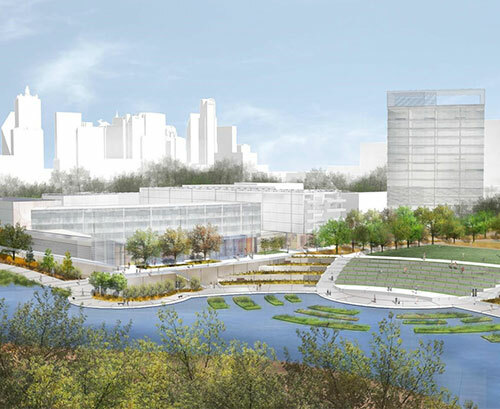 Selected as the winning entry of the mixed-use development category, the project was praised for the innovative approach to treat stormwater runoff by means of a biofilter treatment train and lake water through floating islands. 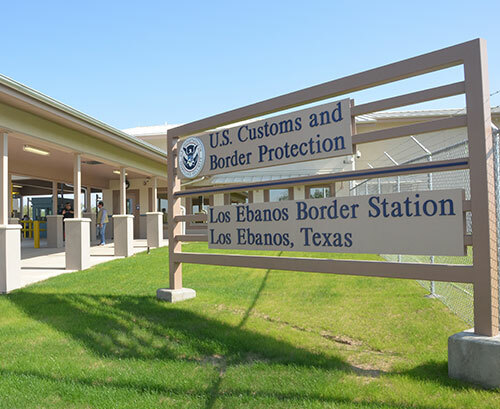 The Land Port of Entry was designed and constructed for the U.S. Dept. of Homeland Security, U.S. Customs and Border Protection and is located in western Hidalgo County along the Rio Grande River at the international boundary with Mexico. 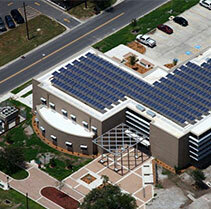 The client’s goal was to achieve “Certified” level of LEED certification. 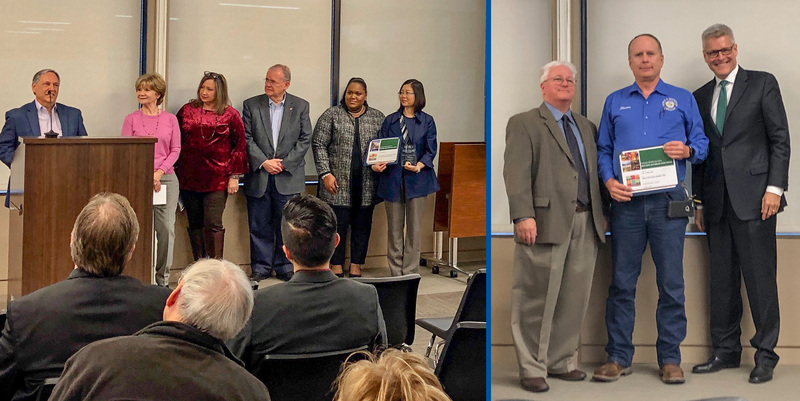 The project achieved LEED “Silver” certification in part because Halff’s project team was able to implement sustainable strategies that were multi-purposed. One example is the exterior concrete masonry walls required for security concerns yielded an added benefit because the team created a highly insulated thermal mass wall system by adding exterior rigid insulation to the wall. The facility was designed for extreme low water use, on-site water treatment and no permanent irrigation. Included in the design were a high SRI metal roof, insulated mass concrete masonry walls, structural insulated panel (SIP) roof system and a high efficiency HVAC system providing 31 percent energy savings for the facility relative to ASHRAE 90.1-2007. A 36 KV solar panel array contributes to reduction in purchased electric energy and provides an additional 12 percent annual energy savings beyond the efficiency attributable to base building systems. Finally, the quantity and quality of water control was analyzed using best management practices (BMPs) to protect the Rio Grande River’s ecosystem.